LONDON, Sep 26, 2011/— Guoman hotels has teamed up with renowned millinery designer, J Smith Esquire, to create five bespoke hats – one for each of the five hotel’s greeting doormen. Launched at the start London Fashion Week (Spring/Summer 2012 Collections), the collaboration is entitled ‘Guoman presents J Smith Esquire: 5’. 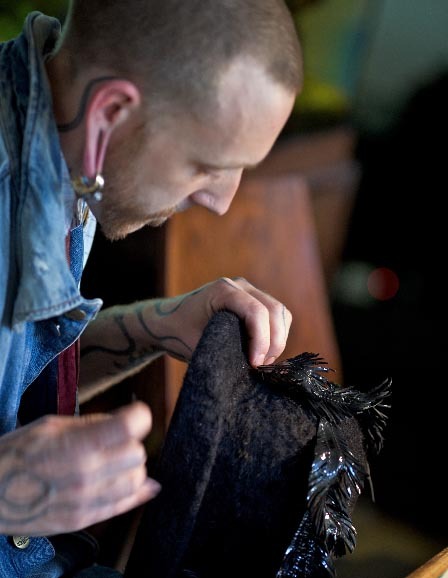 The hats are all unique designs which have been exclusively created and handmade for Guoman Hotels by the millinery label’s owner and founder, Justin Smith, in his London studio. Two exhibitions – on view at The Royal Horseguards [http://www.guoman.com/en/hotels/united_kingdom/london/the_royal_horseguards ] and Charing Cross hotels – have been curated by Gemma Williams to celebrate the launch of the doorman hat collection and will also showcase couture collaborations and archive pieces from the last five years of Justin’s work. “I thoroughly enjoyed the design process for this project and spent a lot of time exploring all five of the Guoman hotels for inspiration. As all five of the hotels are so individual in their design and history, I have created each of the hat designs with a distinct embellishment. I have always been inspired by international design-takes for hotel doorman uniforms and so have used this interest to create a refreshed, couture take on what is such a classic, traditional bowler hat shape,” explained Justin Smith, milliner and ‘J Smith Esquire’owner and founder. The retrospective exhibition and catalogue, curated by Gemma Williams, will be the focal point of the ‘J Smith Esquire”s London Fashion Week presentation. Guoman Hotels’ flagship luxury London hotel [http://www.guoman.com ], The Royal Horseguards, will host an exhibition featuring all five of the doorman hats along with pieces from the ‘J Smith Esquire’label and designer collaborations. Guoman Hotels’ Charing Cross, a four-star luxury railway hotel located literally in the very centre of the capital, will play host to an interactive audio-visual experience which will illustrate the full creation process for the project as well as from Justin Smith’s diverse career. The designer doorman hats were launched as Guoman Hotels’ doormen uniforms from the first day of London Fashion Week. The concentrated exhibitions will run across The Royal Horseguards and Charing Cross hotels for five weeks in total. Guoman Hotels welcome visits to both exhibitions complimentary during this time, no booking necessary.